Secrets of the Magician of Motion…ED PARKER. He calls himself a magician of motion-and at 48 years of age he claims he has to be one just to persevere. But this self-proclaimed master of illusion pulls no rabbits from a hat. Instead, this martial artist, called by some the “father of American kenpo karate,” has of late revealed to a few faithful followers -and now to BLACK BELT magazine the secrets of his fighting art. For illusionist Ed Parker, the magic which comprises his repertoire is no mere collection of cheap tricks, however. The magic of his art results from more than three decades of intense martial arts, involvement in Hawaii as a student and in California (since 1956) as an instructor and promoter. He is known for his Long Beach International Karate Championships and as an instructor who awarded black belts to students such as Jay T. Will, Dan Inosanto and Jack Farr, all of whom have gone on to distinguished martial arts careers of their own. To get to the core, however, the kenpoist applies a strategy that simultaneously makes his points and captures the interest of an audience to the same degree as a master storyteller -or magician- may when his material is novel. Parker the storyteller relies in great measure on analogy and metaphor to emphasize the points he considers crucial in revealing the magic of his kenpo system, a diverse system he said he believes represents the cutting edge of martial arts advancement in the United States. Although Parker may enthrall an audience during one of his frequent demonstrations or clinics, the kenpoist today said he remains just as excited over the potentialities of the martial arts as he did at his first introduction to the arts-in church. Parker recalled a skinny and not particularly strong church mate who bragged of whipping a bully because of his knowledge of the martial arts. “He’s lying in church!” Parker said, exclaiming at the time. But he made a “convert” of Parker then and there with a quick show of technique. Impressed, Parker soon went to his church mate’s brother, William Chow, and began his lifelong involvement with the martial arts. After further studies with Chow and kenpoist James Mitose, Parker enrolled at Brigham Young University (BYU) in Provo, Utah, in 1949. His college studies interrupted by the Korean conflict and military service, Parker returned to BYU in 1954. While still a student, he began teaching kenpo at a local body-building gymnasium. Parker completed his university work in 1956, made the move to California in 1956 and opened a school. Success followed. Parker soon franchised his school operations, and the martial artist retained a roster of some of Hollywood’s leading actors and actresses among his students. But for all the trappings of success, Parker maintains he found himself excluded from the mainstream of martial arts. Martial artists and others are listening to what Parker says concerning the martial arts, however, for he said he travels an average of twice a month from his Pasadena, California, home, visiting teachers and providing demonstrations and conducting clinics. Parker remarked that his journeys are invaluable as a way for him to propagate his kenpo system and for his understanding of the development of martial arts overseas. The kenpoist recalled a Chilean instructor who had studied under him in the United States more than a decade ago. Parker said he gave a series of demonstrations and offered clinics not only for instructor Petite but also at a naval base at Concepcion, a port facility south of Chile’s capital city, Santiago. 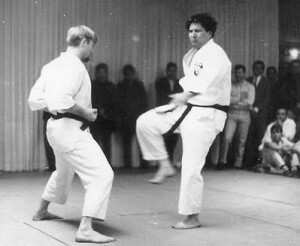 The Hawaiian-born kenpoist remembered the rousing success of his demonstrations as he and local martial artists shared their expertise. Parker said the crowds “went wild” over his performances, not merely because of his skill but -and Parker stressed the point- also because the American gave the local martial artists a full measure of respect. Parker said he found Chileans to be particularly wary of foreign martial artists who offer their individual styles to local students. “There’s a guy who’s a commander in the Air Force, a guy named Commander Alvarado, and he’s in charge of deciding who does or does not come into Chile to teach,” Parker said. “They do have various styles, but they will not allow any group to come in and take over. They want them to come in for a period of time to disseminate any information and training that will enhance their people and that’s it. The kenpo stylist said he has found a similar desire for the locals to control the course of their martial arts programs in other countries in South America.